On September 26, Death Talk Project presents A Finished Heart, written and performed by Eliott Cherry. A Finished Heart is a love story – a solo performance of real conversations between a dying man and his husband. A panel discussion will follow. Free admission, made possible in part by funding from the City of Portland and SE Uplift’s Neighborhood Small Grants Program and the support of the Clinton Street Theater. Learn more. When did you first conceive of A Finished Heart? As soon as I knew Chris was dying, I wanted to keep him – and our marriage – alive and visible to the world. There wasn’t so much a sense of conceiving, but of me being conceived by the boundless intimacy of caring for Chris and helping him die – born by it, I guess. Did you have any sense, when recording the conversations with Chris in your diary, that they might be shared publicly? Yes, though I didn’t know how public that would be and how much I would share. We had so many conversations that I needed to omit from the piece. I knew I had to tell our story so I asked Chris’ permission and he was totally supportive. Chris wanted people to know us and to know what he went through. “Don’t tell people I had an easy death,” he said, “tell them the truth.” But at the time, I didn’t know how this would take shape. How did the process of creating A Finished Heart affect your grieving process? I worry that talking as if I’ve been engaged in a process plays into the idea that whatever it might be comes to an end. Society seems so invested in having people who are widowed “get back to normal.” But more than that, my experience doesn’t feel like a process. It doesn’t even feel distinct. If I create a separate concept called “grief,” language and thought separate this reality from the big picture: the totality of my life. For me, there are no boundaries to be described and no reason to have them. Regarding the birth of A Finished Heart, I’m concerned that describing it as creation overshadows my feeling that I – and whatever I manifest – have been created by forces other than me, bigger and stronger than I can ever know. In terms of describing its effect on me, I can’t know what my life would be like if A Finished Heart had never existed. But I can say that performing the piece is an inseparable part of how I live a life that feels whole, which allows me to survive. So, I don’t have a process or a self. There’s some kind of transformation, but it feels best not to use my mind to engage with it. I just live within a state of being. Maybe, I could call it surrender – not in the sense of losing a battle, as if anything in the end can be won, but being vulnerable to experience the losing, which seems to empower my strength to continue. I find language can have huge limitations. I don’t want to define my experience or have it defined. It’s true, I’ve used the word “grief” at times because communication without common vocabulary becomes impossible. That’s why ongoing conversations are so important. Sometimes, though, if they become philosophical, I can find them limiting, too. I want most to live within a world of inspiration through emotional connection, and that brings me back to A Finished Heart. How has your relationship with Chris, his death, and your grief changed over the course of performing A Finished Heart, if at all? In order to survive, what’s most important for me to address is my relationship with the external world. The more time goes by, the more I’m expected to talk less and less about Chris. Sometimes I try on that mantle just to feel more accepted. I deny a sense of great unease, as if that is the price I must pay. Then, a performance of A Finished Heart comes up and I start to rehearse, talking with Chris, feeling with him, feeling his life, our life together, immersed in our intimacy. All of a sudden, I feel wonderful. I like to think that people are well-served by sharing space with me during performance as I feel wonderful, talking with Chris. What do you think Chris might say about what you’ve done with A Finished Heart? I think Chris would especially like how the piece reveals our perspectives on life and death changing in unpredictable ways. He had a strong belief in the value of chaos – in the sense of inner life engaging itself, out of reach of the mind. Chris would simply be thrilled with what I’m doing with A Finished Heart. He IS completely thrilled. Ah, I just used the present tense, didn’t I? But he’s not here, physically. I miss him more than words can convey. What can you tell us about the title? While I was caring for Chris, he lost consciousness at a certain point. Nine days later, sleeping next to him, I awoke and touched his chest. His physical heart was no longer beating. Its role was complete. This was a blessing for Chris. It was also the birth for me of a consciousness not just of spirit – but of our bond as a married couple that felt heightened beyond mortal experience. The title does make people wonder what I’m talking about: if love is forever, how can I refer to “heart” as finished? The only way I can really impart what means most to me is through the performance, so please come to the show! Anything else you feel moved to share about the process of developing and performing this piece? I can’t say strongly enough how important it was for Chris and me to be visible in the world. 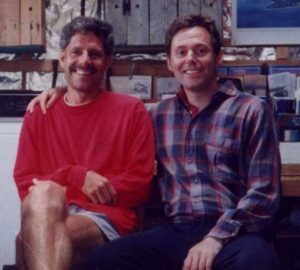 Integral to the strength of our marriage was that we were two men, out and proud as a devoted, married couple. Being proactively public was essential to our health, how we cared for ourselves and each other. So, in the hospital, we didn’t hesitate to show affection for each other and to let people see that we were losing each other as spouses. Chris felt deeply for people. A Finished Heart is a pathway for his caring to continue and for us to keep growing together in a way that builds the kind of community we’ve always hoped for. Not only did this nurse accept Chris’ comfort, we could feel that she truly accepted us as married – and this may have been a revelation for her. It’s crucial for me to expand this energy. As Chris died before my eyes, I felt it impossible to continue to use the word “partner” to refer to him. The emotional reality is that I was losing my husband and all that represents in the most beautiful sense of the word. To have the world not just see – but to feel our marriage, no less sacred than if we had been a heterosexual couple, is a driving force behind continuing to perform this work. I do understand why some people prefer to use “partner” and how, from personal viewpoints, the traditional terms “husband” and “wife” can be very problematic for both gay and straight couples. For me, though, “partner” is tainted as the word we were merely allowed to use – the default language that applies to gay people, because we were forbidden by law to marry. In 2017, same-gender couples throughout the U.S. are allowed to marry. Does that mean we can be less vigilant? In our current sociopolitical climate, I think it’s all the more important to tell our stories and to support each other by celebrating our power as people who operate from within the worlds of love and acceptance. But regardless of our political times, I believe that love stories of same-gender marriage, like A Finished Heart, need to be celebrated forever in order to help build and sustain community with all those who are oppressed. Here in Oregon, we can be proud of how lifting up the voice of an oppressed minority group – in this case the gay community– led to greater choice and humanitarian care of anyone who may face unbearable disease at the end of life. It was during the height of the AIDS crisis that LGBT activists collaborated with advocates of choice in dying to press for Oregon’s Death with Dignity law in order to alleviate terrible suffering. If audience members have questions about this, Compassion & Choices, the organization instrumental to Death with Dignity, will be represented on the discussion panel after A Finished Heart. A Finished Heart is about more than caregiving, end-of-life, loss, and social action. It crystallizes the essence of marriage without regard to sexual orientation. A Finished Heart champions this union that is so primal and revered — underscoring the individuality of marriages and the people who have become, as one, to comprise them. I’d encourage people to come to the show simply to experience an enormous feeling of love. It’s a great honor to present A Finished Heart to audience members who enter the world of Chris and Eliott and who may also share their own stories and feelings with generosity and trust.